By Moki Stephen Mokondo in Buea for Fako UK, Fako America and Fako News Centre. 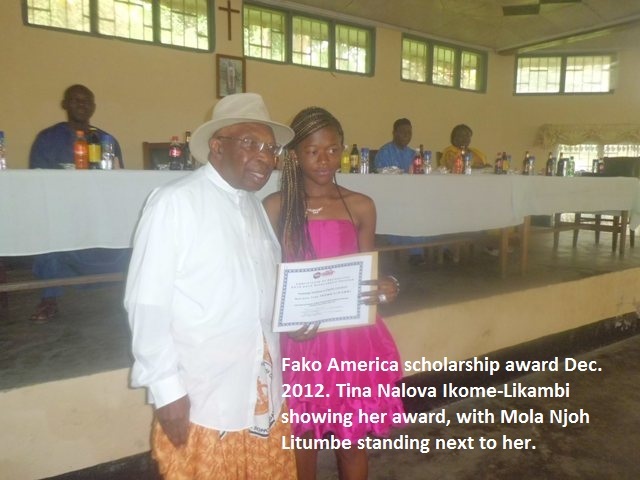 Students who originate from Fako Division have once more been encouraged by their senior brothers and sisters who are members of the Fako America organisation based in the USA. 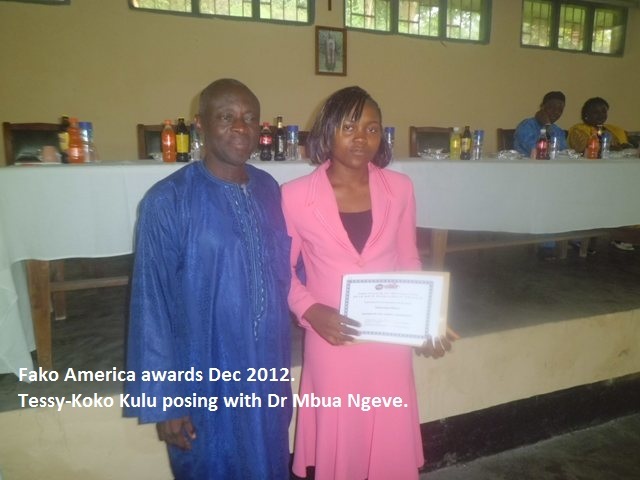 While presenting the 2012/2013 edition of the Fako America (FA) Award at the Presbyterian Church in Cameroon banquet hall, Buea Station, the representative of Fako America, Dr. Evell’a Kange, called on the beneficiaries to excel in their various areas of studies so that they can powerfully represent the Fako community anywhere and at anytime. Dr. Kange explained that the beneficiaries should not look at the cash worth of the award but the concern the donors have for their academic welfare. 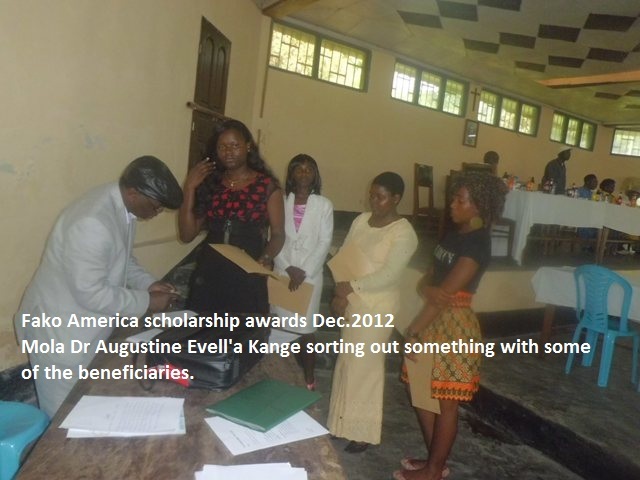 Motivating them to stand out with better results in future, Dr. Kange noted that the recipient were carefully selected after their applications were scrutinised by Fako America Organisation. Those who could have had better results and did not apply were not part of the recipients. Acknowledging the fact that most people of Fako origin are selfish to each other by nature, Dr. Mbua Ngeve cautioned the young ones to avoid this habit but to learn to lend their support to each other whenever they have the opportunity. Explaining his experience to the young scholars, he disclosed that education is a whole long process full with frustrations. He however called on them to have ambition and develop the spirit of endurance. 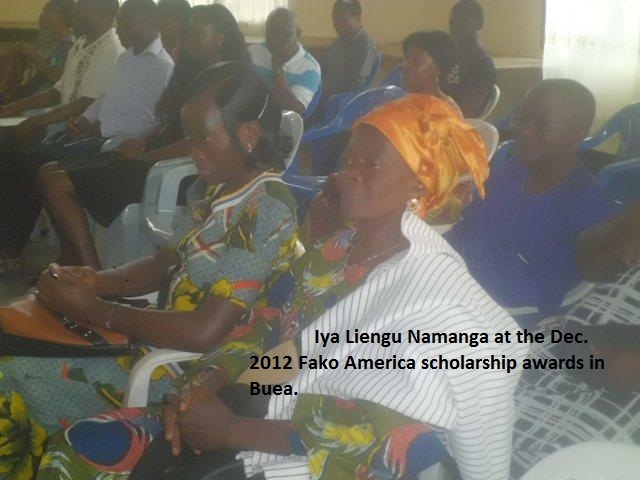 On her part, a parent who attended the ceremony, Iya Liengu Namanga, prayed FA members to impose the Fako Traditional attire to all recipients in future editions of the FA scholarship award. According to her, she was scandalised that none of the recipients, their parents nor the Fako dignitaries invited (other than Mola Njoh Litumbe and herself) were dressed in the Sanja and Kaba which are the Fako traditional attire for the males and females respectively. 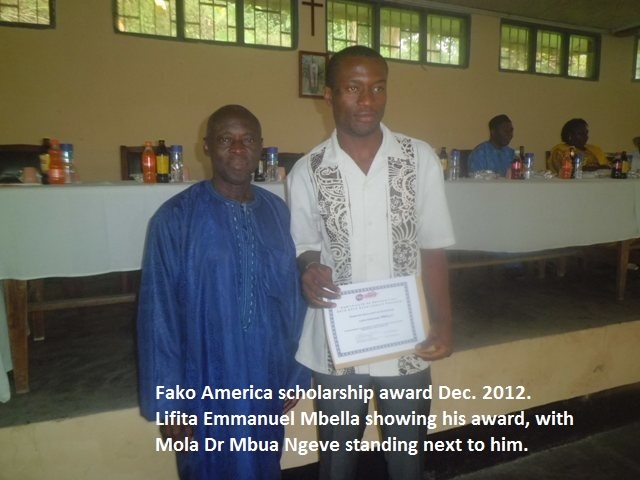 Speaking on behalf of the recipients, Emmanuel Lifita Mbella, thanked Fako America members for their kind gesture. Mola Lifita Mbella who received a special award for Promoting Excellence in the Sciences, encouraged his peers to venture their studies in specific areas that are career oriented like agronomy, crop protection etc. He however pledged continuous progress in their academic performance. 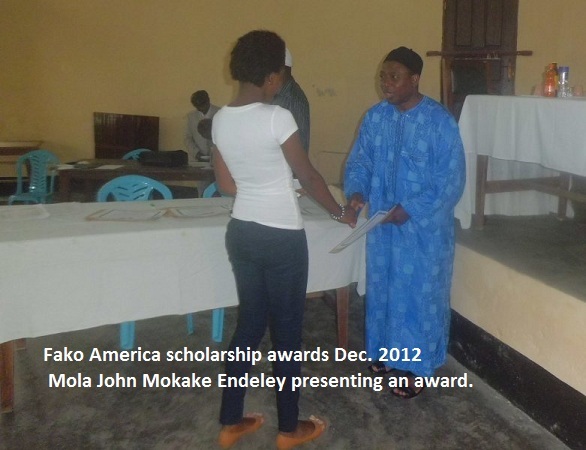 Of the hundreds of application they received, the Fako America panel decided to select 47 beneficiaries for the award; with 10 awards for the Masters Level, 16 for the Bachelors Level, 4 for the Professional Training, 9 for the General Certificate of Education (G.C.E) Advanced Level and 8 for the G.C.E. Ordinary Level. Awardees,family and friends of awardees, our special invitees, the Fako Community, and the general public. We members of Fako America are proud and honored by your presence here today despite your busy schedules, especially during this festive season. One of our very own Mola Ndoko na meinah maini who would have been here with us today transitioned onto eternity between our 2011-2012 awards and today’s ceremony. 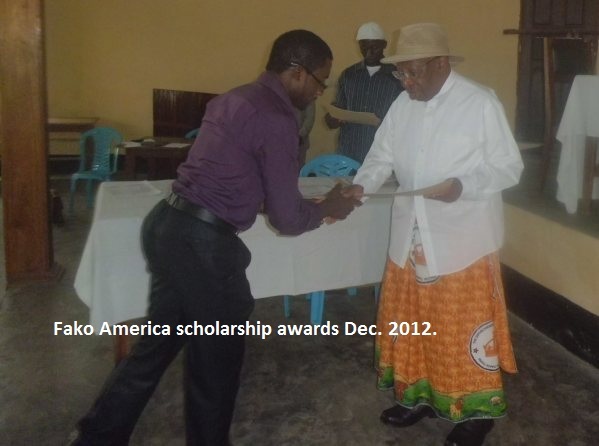 He was a great supporter of Fako America in the USA and here in Cameroon. Let us observe a moment of silence in remembrance and peaceful repose of all our loved ones gone before to the great beyond in 2012[silence]. May their souls rest in perfect peace. As you are well aware, our presence here today is to honor Fako Students who have excelled in their various fields and levels of academic studies during the 2012-2013 school year. Our honorees and awardees were selected from a large pool of applications. This year the application process was entirely online or via the internet and applicants this session, were expected to do a little bit more in terms of the application process. For the last two years only university students applied online, while others were automatically selected from ‘ready-made’ lists, for example G.C.E results, lists supplied by relevant school authorities, etc. We are thus starting to challenge our Fako Students to take advantage of the internet services. Our awardees for the first time were categorized based on their extent of academic achievement and this categorization is also reflected in the awards received. It is our hope that this categorization will increase competition for academic excellence in our Fako Students. While the academic excellence and academic hard work divisions may seem superficial, they are not. The differences in awards received is no longer based on your level of study but rather the performance of an applicant at his/her level or field of study. On the other hand applicants that did not make any of the lists this session should not be discouraged-remaining steadfast and continuing the hard work is all it takes for you to be able to make it. To our proud awardees we congratulate you and your loved ones and we look forward to your own community contribution as contained in your application package. The monetary worth of your award in not as important as the honor and prestige that our organization associates with these yearly awards. Fako America will succeed in its mission when our scholarship program will become an important reason why Fako Students will want to not only succeed but to excel academically. 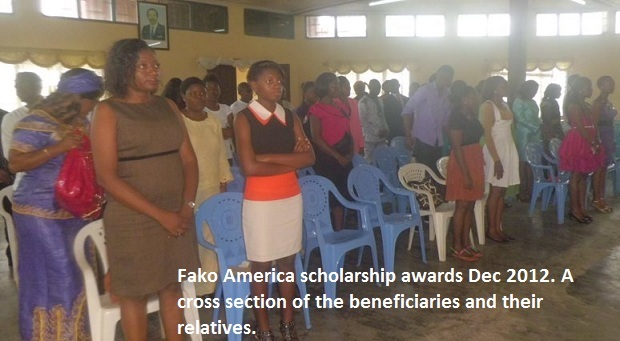 Fako America does not only award scholarships in Fako Division. In the past we have also been engaged in other projects perhaps without much publicity. One of the questions in this year’s application package was ‘your knowledge of Fako America’. This question was poorly answered, which led me to believe our organization may need to do more to publicize our existence and mission in Fako Division. To this end, I have requested our Historian-Mola Evella Kange[ himself a former FA President, and a PhD in Business and Engineering], to summarily explain and /or give a brief history of our organization and our involvement in Fako Division. You will also recall that once you applied for our scholarship you were subsequently and automatically subscribed to the ‘Lilolaphako’ egroup. Lilolaphako was created by and is part owned by Fako America. It is an internet forum open to all Bakweri People the world over and an egroup where unethical postings are unacceptable. Lilolaphako has four moderators: Africa-Mola Ekema Monono, Europe-Mola Ngoina Elive, North America-Iya Embelle Litumbe, and Fako America Representative-Mola Evella Kange. Lilolaphako is one of Fako America’s contributions to the larger Fako Community. We urge you to take advantage and make maximum use of this forum. The sanity of this egroup is assured and will be maintained. If you are here and wish to be registered with this eforum-just give your details to any of the moderators here present. We are already seeing positive fruits of lilolaphako-some of you here seated and recipients of today’s awards have posted your positive comments about this scholarship program-for the world to see and hear. You are thus ambassadors of Fako America already. Thank You. Fako America will do greater and more things if our membership is increased. Be our ambassadors and urge your relatives and friends who are resident in the USA and are not members of our organization, to consider doing so. You may want to request them to ask us about our attractive Insurance Program, our Bakweri 101 Competition, our Cultural Jamboree, and many more. 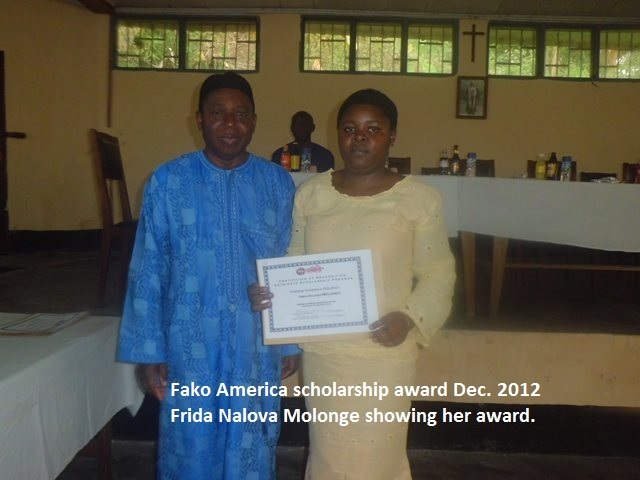 While membership in FA is not mandatory simply because you are a Mokwe, it becomes FA’s concern and business, whenever any Fako Child in the USA is in need of assistance. Our concerns transcend FA membership. There is strength in numbers and unity and of course, there is no perfect organization. Fako America is grateful to the Presbyterian Church in Cameroon Synod Office in Buea, for making it possible for us to use their Banquet Hall for this ceremony. Earlier this year, two PCC Primary Schools were beneficiaries of our Bench Project. The PCC is thus partners with Fako America, just like all of you who are seated here today. To our special invitees, FA recognizes your individual and collective contributions to the Fako People and Fako Community as a whole. We salute your efforts. My appreciation and respect goes to all FA members, private scholarship sponsors, Moki Mokondo, Ndiva Lisinge, and the many others who made these awards and occasion possible. To the Vice President-Mola Moka Moliki and Treasurer-Iya Liengu Litumbe-Hill, Secretary-Iya Efeti Mongo, the Director of Communications-Mola John Forseh Wotany, the Director of Culture-Iya Ewuna Mukoko, and the Financial Secretary-Iya Mamua Mbua, I say thank you; My gratitude also goes to Board Members-Mola Jack Endeley/Chair, Mola Sam Moki/Secretary, Iya Mojoko Sona, Iya Nanyongo Mongo, Iya Efeti Ojongtambia, Mola Esuka Endeley, and Executive members in the board. The online application process was made possible by Iya Embelle Litumbe, working in concert with the communication team of the executive. Gratitude is also due Iya Mojoko Matute, Iya Enjema Moliki, and the kids-Mavita, Malingo and Moname, for their daily support. We specially salute our Nakuveh and Paramount Chief of Buea; His Royal Highness Chief Samuel Moka Lifafa Endeley, as we look forward to his 90th Birthday next June. Accept Seasonal Greetings of Our Highest Esteem.